Dear Lord, please do not forsake us for our poor judgment. Last week when our cat inadvertently drank my triple Espresso I left on the kitchen table my husband suggested that our family take up a new (caffeine free) hobby, and include our cat. We enjoyed it, however, I don’t think our cat was amused, Amen. After a successful career in Art Administration, at Temple University/Tyler School of Art, Deb has taken on a new challenging career as an aspiring writer. Author of short story A Hot Dog Stand in the Himalayas Deb has written her first novel published by HumorOutcasts Press titled, Love, Montana. A quick read crossing the genres of contemporary western romance and travel adventure with lots of witty humor thrown in the mix. Also check out Deb's popular HO series Friday Humor Devotional. It's prayer with an attitude. Cats never accidentally steal our caffeine. It’s purposely done. More on this when I further develop my theory. This is true Bill Y. I may have accidentally spiked it with catnip; however, continue your theory. Perhaps next week another CATastrophe . . . corner.standing. I am imagining one very angry, wet cat! Yeah Kathy but seeing a cat in flippers made it all worth while, lol! Taking steps to get more fish in his diet. 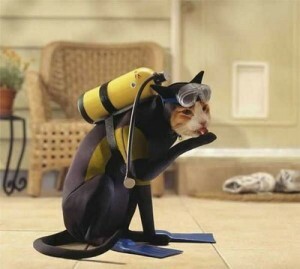 Scuba Doo!